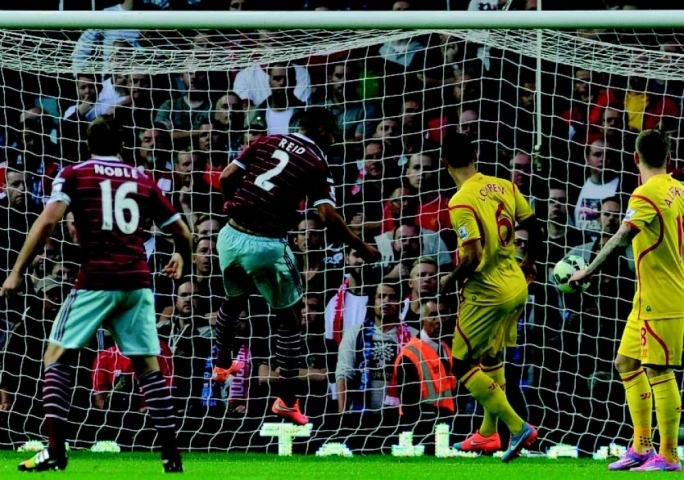 West Ham United ixxukkjaw lil Liverpol meta ġewwa darhom għelbuhom bl-iskor ta’ 3-1 biex komplew ikabbru l-problemi għal Liverpool li sa issa kellhom ftuħ ta’ staġun mill-iktar diżappuntanti, għalkemm akkwistaw lil Mario Balotelli. Il-gowls għall-Hammers waslu minn doppjetta ta’ Winstoin Reid u gowl ta’ Morgan Amalfitano waqt li l-uniku gowl għar-Reds wasal minn Raheem Sterling. Arsenal barra minn darhom għelbu lil Aston Villa bl-iskor ta’ 3-0 bil-gowls għalihom jaslu minn Mesut Ozil, Danny Wellbeck u awtogowl tal-plejer ta’ Aston Villa, Aly Cissokho. Fil-konfront bejn Newcastle United u Hull City rajna xejn inqas minn erba’ gowls hekk kif dan il-konfront intemm f’parità ta’ 2-2 bil-gowls għall-Magpies jaslu minn doppjetta ta’ Cisse waqt li l-gowls għal Hull Cuty waslu mill-plejer Kroat, Nikica Jelavic u minn Mohamed Diame. Bl-istess skor intemmet il-logħba bejn Queens Park Rangers u Stoke City bil-gowls għal QPR jaslu minn Caulker u Kranjcar waqt li ż-żewġ gowls għal Stoke City waslu minn Diouf u Peter Crouch. Southampton kisbu tliet punti prezzjużi meta barra minn darhom għelbu lil Swansea City bl-iskor minimu ta’ 1-0 bil-gowl waħdieni tagħhom jasal minn Victor Wanyama fit-80 minuta. Tajjeb ngħidu li Swansea City spiċċaw jilagħbu b’10 plejers fid-39 minuta meta tkeċċa għalihom il-plejer Wilfried Bony wara li rċieva żewġ karti sofor fil-logħba. Intant, il-konfront bejn Burnley u Sunderland intemm f’parità ta’ mingħajr gowls. Fil-Kampjonat Taljan Serie A TIM, Cesena u Empoli temmew il-konfront tagħhom f’parità ta’ 2-2 bil-gowls għal Cesena jaslu minn Marilungo u Defrel waqt li ż-żewġ gowls ta’ Empoli waslu minn penalty ta’ Francesco Tavano u Daniele Rugani.